ISIS is a new company offered by Enjuku Racing, whose goal is to provide high quality parts at an affordable price. The parts they offer range from aluminum radiators and intercoolers to underdrive pulleys and exhausts. Companies like ISIS allow those of us who are feeling the pinch of these tough economic times to upgrade their cars with good quality parts without breaking the bank. 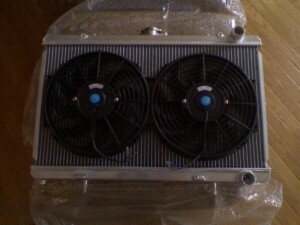 I recently installed my ISIS Aluminum Radiator and two 12in ISIS Fans for my 240. I never realized how much of a difference in cooling this would make. Let us start with the price. Listed at $199.99, it is one of the leas expensive aluminum radiators of it’s kind. With the stock radiator and fan set up I can’t say I was over heating but I did notice that at events on hot days the temp gauge would wander a little higher than I liked. So when I found the ISIS radiator I figured I would give it a shot and upgrade. Compared to stock the ISIS radiator is MUCH thicker. This is one of the things you notice once you install it. If you are keeping your stock clutch fan you may have trouble re-using the stock shroud because the radiator is thicker, I don’t know for sure because I used the ISIS fans and got rid of the clutch fan. The radiator has mounts for the stock electric fan built in so you can re-use it. As far as looks, the radiator is shiny but not quite polished like Koyos and the sort but could be polished w/ a little elbow grease if that is what you are worried about. The installation is pretty straightforward and easy. The fit is a bit tighter but again you have to realize the radiator is significantly thicker than stock. Due to a previous radiator fitment issue, I had modified the bottom mounts and the top mounts, so I wound up making my own top mounts. Had I not modified my mounts I could have re-used my stock brackets and all. So the radiator install is pretty much a remove and replace deal. Adding the fans to the situation isn’t hard at all and is more than worth the $34.99 per fan. These fans are awesome, low profile and flow plenty of air. After I got them installed I took it for a drive into town. I am not running a t-stat and it was a cool night so I knew it was going to take a while to warm up. I didn’t know that the needle wouldn’t even hit the cold mark until I got into town and sat in a drive through for five minutes. The car only started to get warm if it was standing still, if it was moving, the temp gauge would be below the cold mark. I wound up letting the car sit for about a half an hour until it finally got warm enough for the fans to kick on… for about 15 seconds… then it had cooled off enough to shut them off. After driving in some stop and go traffic on hot days, the car has no trouble staying at operating temp. Even under spirited driving the car stays nice and cool and if there is good air flow through the radiator the fans barely ever need to turn on.